I think every blogger has their blogger heros. My hero is Bea from Bea w kuchni. She is a great lady dedicated to seasonal, healthy cooking, that is crazy about pumpkins. Her blog is one of those places in the network, where you feel at home and you can always take part in a real conversation with real person. At some point Bea praised cookbooks of Maria Elia, so once I saw one in a shop on sale I bought it. The cookbook is beautiful. I won’t tell you if it is good, I’ve just tried one recipe and I can say it’s brilliant. I mentioned more than once I’m a lazy cook. I appreciate recipes that made themselves, but still use unprocessed food and taste delicious. I must admit we cheated a little bit, we didn’t refrigerate the chicken as we were in hurry. I’m sure it would improve the flavours, but they were great anyway. I’m not a big fan of warm tomatoes, but these ones add great acidity to the quite sweet dish. The recipe may look quite long, but it’s very simple. Grease a roasting tin or line it with parchment paper. Wash the butternut squash and cut it into chunks (leave the skin on). Place it in the tin and sprinkle with salt and drizzle it with some olive oil. Make a chicken marinade. Grate the garlic finely and mix it with the salt, smoked paprika and enough of olive oil to make a runny paste. Place the chicken in the pan atop the butternut squash. If possible refrigerate at least for an hour or preferably overnight. Preheat the oven to 180°C /160°C fan. 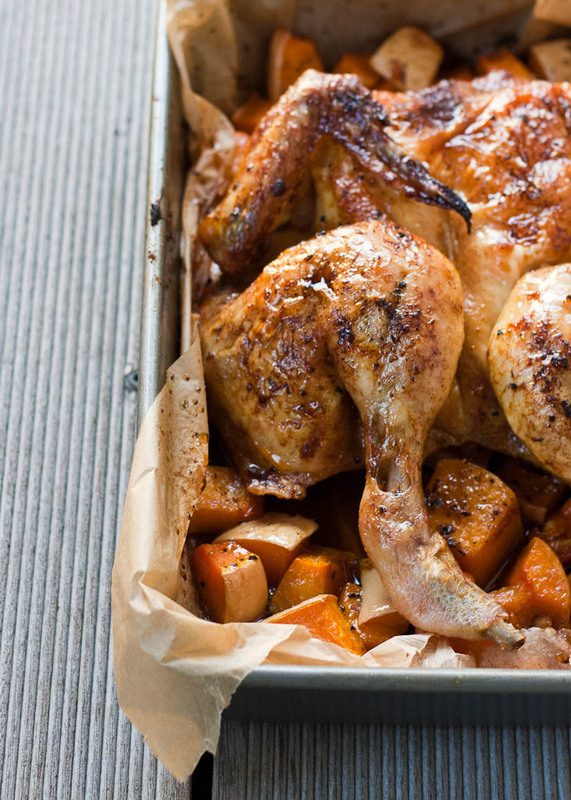 Place the pan with chicken and butternut squash in the oven and bake for 30 minutes. Lower the temperature to 160°C /140°C fan and cook for further 1 1/2 hour, pouring the chicken with its juices every 20 minutes. Remove the chicken from the tin, cover it with a tin foil and let it rest for 10 minutes. In the meantime add the butter bean and tomatoes to the pan and put it back to the oven, just to warm it up. Take the veggies out of oven and sprinkle with some salt and pepper. Toss in the basil leaves. Cut the chicken and add place it on a plate along with veggies. Posted in Autumn, Meat and tagged basil, butter beans, butternut squash, chicken, maria elia, tomatoes. Bookmark the permalink. This chook looks delicious Magda, I’m also a big fan of butternut squash so must try this some soon. I’m making squash, caramelised onion and goatscheese galette for dinner tonight – can’t wait! I love Autumn for these types of dishes! Thank you Adrienne. I just learn to like butternut squash, but I know so many people who love it so it must be good. I love this combination with cherry tomatoes as it actually adds this bite, I’m usually missing. Tak, tak Beo, hero. Zawsze mnie mobilizujesz do czegoś, do czego zbieram się od dawna. Co prawda idzie mi to strasznie opornie, ale to już nie Twoja wina, a moja własna. No i na Twoim blogu czuję się jak u Ciebie w domu za co Cię niezmiernie lubię. To w takim razie pierwsze dyniowe gratulacje, ja się pewnie zabiorę znowu za dyniowe podejścia, jak widzisz butternut idzie mi coraz lepiej. Mi strasznie pasowały te pomidorki, bo często dynie są dla mnie za mdłe, nawet jak są przyprawione. I love, love, love butternut squash and other squashes as well!!! therefore I am happy that fall has arrived. Your recipe Magda looks interesting – just as you said; “one stop cooking “is great for busy people! Looks delicious, Magda! Lots of squash around at the moment so will have to give it a go!